In order to encourage corn production, several herbicides such as nicosulfuron and topramezone are used. Though they offer great advantages, they may affect crop productivity and may even induce DNA damage. This study evaluated genotoxic activity at two nicosulfuron concentrations (40,000 and 80, 000 ppm) and at four topramezone concentrations (1480, 148, 14.8 and 1.48 ppm) in sweet corn and hybrid populations from Mexico and South America. NCMAMD were used in 113 variety accessions from Mexico and South America and on 5 commercial hybrids for nicosulfuron and 9 accessions and a hybrid for topramezone. Both nicosulfuron concentrations induced significant genetic damage (P < 0.01) on sweet corn and on normal hybrids. Topramezone showed significant genotoxic activity (P < 0.01) on both sweet corns and normal hybrids. On both sweet corns and normal hybrids, the original situation did not provide protection from genetic damage caused by herbicides and all showed significant genetic damage (P < 0.01) compared to their corresponding negative controls. This paper clearly shows nicosulfuron and topramezone genotoxicity and the study with comet assay in SCAMCN indicated that corn can be used as an excellent biomonitor for genotoxicity assessment. Corn is an extremely important crop, only in 2016 a total of 28 million tons of corn were produced (SIAP-SAGARPA, 2016). Corn is used in the production of a great number of products (Fernández et al., 2013; Yadar and Supriya, 2014). Fertilizers, pesticides and herbicides are used to increase crop production and quality (Bolognesi, 2003; Hernández et al., 2016). Though herbicides offer many advantages, some of them produce adverse effects and may even be genotoxic, induce DNA damage and affect crop productivity (Aksakal, 2013; Valencia-Quintana et al., 2013). Two of the herbicides used in corn crops (nicosulfuron and topramezone) are used to control weeds (Labrador et al., 2000; Nuraky et al., 2011; Peachey and Mallory-Smith 2011). In USA, many sweet corn varieties are severely damaged by herbicides such as nicosulfuron and topramezone, applied once seedlings have emerged (Pataky et al., 2006). Liu et al., (2003) reported the absence of mutagenicity due to nicosulfuron in Salmonella thyphimurium and in mice. Tifensulfuron is an herbicide chemically related to nicosulfuron which did not show mutagenicity during tests on Salmonella typhimurium, micronucleus and chromosomes (Wang et al., 2004). However, another herbicide chemically related to nicosulfuron, belonging to the sulfonylurea family, did show to genotoxic activity in Drosophila melanogaster (Heres-Pulido et al., 2008). Logran, which is also related to nicosulfuron, induced a series of chromosomic aberrations in meristem cells in the tip of Hordeum vulgare L. and Triticum aestivum L roots (KaymaK y Gokalp, 2006). In regard to topramezone, there is not enough evidence of genotoxicity. However, fipronil which is chemically close to topramezone, induced a significant increase in sister chromatide exchanges as well as micronucleus in human lymphocytes (Celik et al., 2014). Other four pesticides of the pirazolone family (bixafen, tebufenpirad, fenpyroximate and tolfenpirad) which are also related to topramezone, have genotoxic activity on cells in the line of SH-SY5Y (Graillot et al., 2012). As to evaluate herbicide genotoxicity, there is a wide array of bioassays which detect genetic damage (Valencia-Quintana et al., 2013; Zúñiga, 2013; Alvarez-Moya et al., 2014). One of the most modern assays for DNA damage detection is the comet assay, which is highly sensitive and reproducible (Singh et al., 1988). This test detects DNA damages such as simple and double chain breakage, crossed covalent bonds between DNA/DNA, DNA/proteins or base deamination due to oxidation damages, apurinic and apirimidinic sites, which results in DNA breakage and sites under repair (Azqueta and Collins, 2013). The comet assay has been widely used for genotoxic activity evaluation in several pesticides (Alvarez-Moya et al., 2014). Due to toxic effects on corn crops induced by nicosulfuron and topramezone, as well as the absence of robust evidence related to genotoxic activity of these two herbicides, detection of activity dependent of the used assay system and reports stating which chemical forms possess genotoxic activity, the need of evaluating genetic damage induced by these herbicides on sweet corn crops, is extremely evident. In the absence of date, genotoxicity evaluation must be carried out in sweet corn plants from different Mexican and South American regions. On this paper, genotoxic activity in several concentrations of nicosulfuron and topramezone in sweet corn apical meristematic cell nuclei (SCAMCN) is evaluating by means of the alkaline comet assay, using Mexican and South American sweet corn population. 113 sweet corn accessions were studied for nicosulfuron, including two varieties from Mexico, three varieties from South America and five commercial corn hybrids (P3060, A7573, Oso, Tornado, Dk-2010). As for topramezone, 9 accessions were used from sweet corn varieties including 5 from Mexico, 4 from South America and hybrid A7573. The seeds from the above-mentioned materials were obtained from the germplasm bank from the Phytogenic Resources Management and Usage Institute (IMAREFI) from the Center for Biological and Agricultural Sciences from the University of Guadalajara. The material was increased during the spring-summer cycle of 2012 using fraternal crossbreeding. The seed of each of the breeds was planted on polystyrene trays with 60 cavities under nursery conditions during the year 2014 until plants reached growth stage 6. Subjects on growth stage 6 were subjected to two different commercial nicosulfuron (2-[(4,6-dimethoxypyrimidin-2-ylcarbamoyl) sulfamoyl]-N, N-dimethylnicotinamide or 1-(4,6-dimethoxypyrimidin-2-yl)-3-(3-dimethylcarbamoyl-2-pyridylsulfonyl) urea) concentrations: 40,000 and 80,000 ppm. Nicosulfuron was obtained from Syngenta Agro in México City. Two subjects were used per concentration and two subjects were used as witnesses without administration, per each accession including hybrids. Topramezone [3-(4,5-dihydro- 1,2 oxazole-3-il)-4-mesil-o-tolyl] (5-hydroxy-1-methylpirazole-4-yl) methanone] was obtained from Basf and the used concentrations were 1480, 148, 14.8 and 1.48 ppm. Five sweet corn variety accessions from Mexico and 4 from South America (the most representative) were used. Six subjects were used per concentration and six subjects were used as witnesses, plus the hybrid. 24 hours after exposure, plants were taken to the laboratory as to obtain nuclei. Cell nuclei of plants exposed to nicosulfuron, topramezone, hybrids and negative witnesses were obtained from meristematic leaf tips. 1 cm leaf cuts were washed three times with distilled water; afterwards they were placed on cold mortars with 3 drops of Honda buffer (0.44 M sacarose, 2.5% ficoll 400 type, 5% dextran T-40, 2.5 mM Tris-HCl, 10 mM MgCl2, 10 mM mercaptoethanol and 2.5% Triton X-100 pH 8.5). Nuclei were obtained by means of tissue maceration and they were filtered immediately through paper filter with 20-25 μm particle retention (Whatman 4). As to obtain nuclei, the filtered liquid was centrifuged 2 times at 3000 rpm (4°C) for 3 min and the supernatant was discarded. The pellet containing nuclei was re-suspended with 200 μL of Honda buffer (Alvarez-Moya et al., 2001) and was refrigerated at 4°C until used. Nuclei contained on suspension were used on the alkaline comet assay as described by Koppen and Verschaeve (1996). Glass slides were covered with a Normal Melting Point (NMP) agarose coat at 1%. Once the agar was solidified, it was removed as to have a completely creal sufrace. Afterwards, 300 μL of Low Melting Point (LMP) agarose at 0.6% were placed on the glass slides. The, 90 μL MLP type agarose at 5% were mixed with 10 μL of nucleus suspension and the mixture was placed on the first coat. Finally, a third coat of 100 μL of LMP agarose at 0.5% was added to cover the second coat. Slides containing exposed plants nuclei as well as non-exposed plant nuclei (negative witness) were submerged in lysis solution (NaCl 2.5 mM, Na2EDTA 10 mM, Tris-HCl 10 mM, lauryl sarcosinate 1%, Tritón X-100 1% y DMSO 10%, pH 10) for 24 h at 4°C. After lysis, slides were placed on a horizontal electrophoresis system with alkaline pH buffer (NaOH 30 mM, Na2EDTA 1mM, pH 13) for 45 min at 4°C, to allow DNA unfolding. Electrophoresis was carried out on the same system for 8 min at 1.0 V/cm with amperage of ~300 mA. Slides were then washed with distilled water for one minute and were dyed immediately with 100 μL of ethidium bromide (20 μg/mL). Afterwards, they were washed 3 times with distilled water and were taken immediately to the fluorescence microscope (Axioskop 40). A 515-560 nm excitation filter was used to measure comet tails and the software Comet Assay System II was used as well. 50 cometized nuclei per studied subject were analyzed. DNA migration data was subjected to variance analysis (ANOVA) using Statistical Analysis System (SAS 9.0). A Dunnett multiple comparison assay was used to evaluate the effect of herbicide treatment of witnesses. A probability level of 0.05 was used. Table 1 shows the genetic damage on sweet corn apical meristematic cell nuclei (SCAMCN) of 113 populations exposed to different concentrations of nicosulfuron. The first concentration produced an average migration of 6.64 μm and the second was of 6.11 μm, observing significant genotoxic activity (p<0.01) in regard to the negative control. However, there were no significant differences when comparing the genotoxic effect between both of the evaluated concentrations (Table 1). Note: Migration average of tail length it is a result of the average of averages of individuals studied. 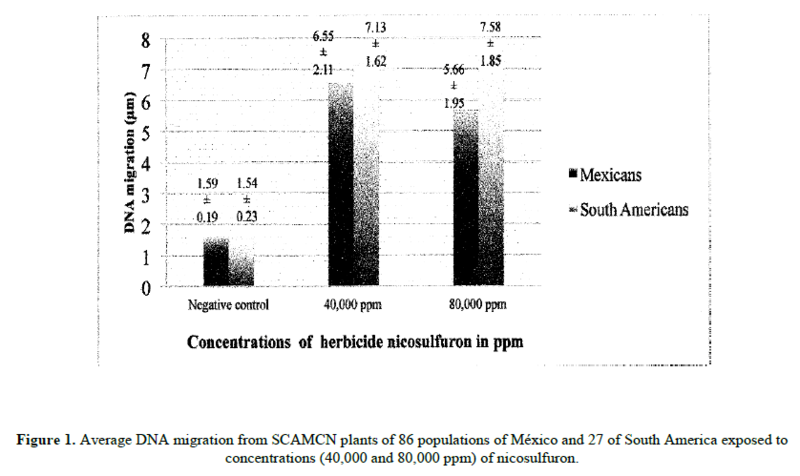 The genetic damage induced by two different concentrations of nicosulfuron on SCAMCN of 113 accessions of México and South America it is presented separately in Figure 1. There is a significant increase (p<0.01) in the comet tail length on both study groups compared to their corresponding negative controls. However, the comparison of comet tails between studied groups (except controls) did not show significant differences (p>0.05). Figure 1: Average DNA migration from SCAMCN plants of 86 populations of México and 27 of South America exposed to concentrations (40,000 and 80,000 ppm) of nicosulfuron. Normal corn hybrids exposed to 40,000 and 80,000 ppm concentrations of nicosulfuron. Table 2 showed a statistically significant genetic damage (p<0.01) compared to controls. Study by origin. SCAMCN of México and South America resulting from the exposure to two different nicosulfuron concentrations as well as the negative control are shown on Table 3. All of them showed significant genetic damage (p<0.01) compared to its corresponding negative controls (Table 3). Note. Migration average of tail length it is a result of the average of averages of individuals studied. Genetic damage is observed on SCAMCN for 5 Mexican and 4 South American accessions exposed to four different concentrations of topramezone (Figure 2). All concentrations showed significant genotoxic activity (p<0.05) compared to the negative control. However, multiple comparisons of migration averages of subjects exposed to different concentrations (1480, 148, 14.8, 1.48) did not show significant differences. Figure 2: Average DNA migration from SCAMCN of plants Mexican and South American exposed to different concentrations (480, 148, 14.8, 1.48 ppm) topramezone herbicide. Significant genetic damage was observed in normal corn hybrids exposed to different topramezone concentrations (Figure 3) compared to the negative control (p<0.01). Figure 3: Average DNA migration from SCAMCN hybrid plants of normal maize exposed to different concentrations (480, 148, 14.8, 1.48 ppm) of the topramezone herbicide. Significant genetic damage was observed on SCAMCN for México and South American compared to its negative controls (p<0.01) resulting from exposure to different topramezone concentrations (Table 4). Nicosulfuron is used in diverse crops and frequently causes plant lesions or death (Robinson et al., 1994; O´Sullivan and Bouw, 1998; Ortiz et al., 2015). Previous reports barely mention acute damage comprising necrosis, chlorosis and plant death (Brown, 1990). On our study, Mexican and South American SCAMCN exposed to nicosulfuron presented significant genotoxic activity (p<0.01). The absence of significance when comparing the genotoxic effect among concentrations indicates that both produce the same amount of DNA damage (Table 1). Previously, Heres-Pulido et al., (2008) and Kaymak y Gokalp (2006) showed the genotoxic effect of triasulfuron (chemically related to nicosulfuron) in Drosophyla melanogaster and on meristematic cells of Hordeum vulgare L. and Triticum aestivum L root tips, respectively. The aforementioned indicates that both nicosulfuron as well as some members of this chemical family have genotoxic activity. Though sweet corn crops are effectively damaged (Pataky et al., 2006; Ortiz et al., 2015) and sensitivity seems to be conditioned by one recessive gene of P450 cytochrome, according to previous reports on hybrid and endogamic sweet corn (Green y Ulrich, 1993; Williams et al., 2005; Pataky et al., 2006; Nordby et al., 2008), this gen is not necessarily responsible for the observed genetic damage. The damage does provide clues of the existing genetic danger. The significant increase (p<0.05) in comet tail length of Mexican and South American SCAMCN exposed to nicosulfuron (Figure 1) indicated that plants from both regions are genetically susceptible and the origin condition does not provide protection to genotoxic activity. Hernández et al., (1996) and Arreaza, (2000) reported that some normal corn hybrids (non-sweet) presented morphologic and physiologic damages due to selective post-emerging herbicides. On our study, in accordance to what is reported for sweet corn (Williams et al., 2005; Pataky et al., 2006; Nordby et al., 2008) independently from the used concentration, significant genetic damage (p<0.01) was observed compared to negative controls (Table 2). The normal hybrid condition did not provide resistance to genetic damage caused by nicosulfuron. As observed, normal hybrids also showed genetic damage due to nicosulfuron, which was not previously reported. Regarding the origin of particular populations (Table 3), it was observed that it does not provide protection to the genotoxic effect of nicosulfuron. There are no previous reports in this sense. Topramezone is another of the herbicides used on corn crops, Soltani et al. (2007), Bollman et al. (2008) y Williams and Pataky (2010) reported tolerance to acute toxic effects (photobleaching) of topramezone on sweet corn hybrids, however the effect of the induced genetic damage was not evaluated. On our study with sweet corn, we observed high genetic sensitivity to topramezone at all concentrations (Figure 2). The aforementioned shows that topramezone is a powerful genotoxic even when there is tolerance on sweet corn hybrids. There are no antecedents regarding topramezone genotoxic evaluation, though four pesticides chemically related to the the pirazolone family have been studied (bixafen, tebufenpirad, fenpiroximat and tolfenpirad) on four cell lines and did show genotoxic activity on line SH-SY5Y cells (Graillot et al., 2012). Fipronil, another chemical related to topramezone, induced a significant increase of genetic damage on human lymphocytes (Celik et al., 2014). All topramezone concentrations showed a genotoxic effect compared to the negative witness, regardless of the concentration (Figure 2). The mencioned implies that even the lowest concentration (1.48 ppm) is capable of producing similar genetic damage to the highest concentration (1480 ppm). Though there is a significant difference between these two concentrations (Figure 2), it is very likely the genotoxic effect of the highest concentration is at such degree that DNA is almost destroyed and results in smaller comet tails similar to those produced by the lowest concentration. This atypical behavior has been reported previously working with nitrosodiethylamide (Alvarez-Moya et al., 2001). The highly genotoxic capacity of topramezone is extremely clear. Regarding sweet corn hybrids, previous reports present tolerance to topramezone (Soltani et al., 2007; Bollman et al., 2008). Out study on normal hybrids (A7573) indicated that regardless of tolerance there is a high degree of genetic damage induced by topramezone (Figure 3). Genotoxicity evaluation of topramezone regarding origin condition (Table 4) showed as expected (Figure 2) significant genotoxicity (p<0.01) compared to the corresponding negative controls on all of the studied populations. It is evident that the origin condition did not provide protection from genetic damage induced by topramezone. As previously reported, the comet assay is efficient for the evaluation of genotoxicity (Azqueta and Collins, 2013) and there are multiple organisms on which the comet assay is used as a biomonitor (Rucínska et al., 2004; Gichner et al., 2006; Olive y Banáth, 2006; Dhawan et al., 2009). Corn crops are continuously exposed to diverse herbicides and some of them are genotoxic (Rucínska et al., 2004; Gichner et al., 2006; Olive y Banáth, 2006; Dhawan et al., 2009). Therefore, having a biomonitor of genetic damage in corn crops is relevant. The comet assay in SCAMCN constitutes an important tool for the evaluation of genotoxic activity of commercial herbicides since it is fast and relatively cheap. Our study shows the benefits of using corn as a biomonitor of genetic damage induced by chemical substances (particularly herbicides). Both concentrations of nicosulfuron induced significant genotoxic activities on sweet corn and on normal hybrids. In the case of topramezone, significant genotoxic activity was shown for sweet corn and normal hybrids. None of the normal hybrids (not sweet) present protection against the genotoxic effect of the studied herbicides. The genotoxic study indicated that both herbicides are genotoxic and that the comet assay in SCAMCN is an excellent tool for the evaluation of genotoxicity. Research partially supported by CONACYT 2012, México. Arreaza M (2000) Selectividad de nicosulfuron (4% SC) en cuatro híbridos dobles de maíz amarillo (Zea mays L.). Rev Fac Agron 26: 79-83. Fernández S, Morales C and Mariscal A (2013) Importance of Mexican maize landraces in the national diet. An essential review. Rev. Fitotec. Mex. 3-A: 275-283. Green JM and Uldrich JF (1993) Response of corn (Zea mays L.) inbreds and hybrids to sulfonylurea herbicides. Weed Sci. 41: 508-516. Hernández L, Mejía A and Jose R (1996) Comparison of selectivity of nicosulfuron (4SC) alone and in mixture with six herbicides in two maize hybrids: Ceniap PB-8 (white) and Himeca 95 (yellow). In: VIII jornadas técnicas en biología y combate de malezas, Maracay Venezuela. Hernández H, Méndez R, Beutelspacher A, Alvarez S, et al. (2016) Factores socioeconómicos y tecnológicos en el uso de agroquímicos en tres sistemas agrícolas en los altos de Chiapas, México. Interciencia. 41: 382-392. KaymaK F and Gokalp FD (2006) The genotoxic effects of logran on Hordeum vulgare L. and Triticum aestivum L. Act. Biol. Hungar. 57: 71-80. Labrador M, Arreaza J and Lazo J (2000) Evaluación de nicosulfuron (4% SC) en el control de malezas en maíz (Zea mays L.). Rev. Fac. Agron. 26: 79- 89. Liu Y, Zhang Z and SHI Y (2003) The mutagenic study of nicosulfuron. J. Chin. Occup. Med. 2003: 10. Nuraky F, Lorzadeh S, Khodarahmpour Z and Rahmany H (2011) Weed integrated management (mechanical+ chemical) in maize (Zea mays L.) with post emergence herbicides. Adv. Environ. Biol. 5: 2063-2066. Ortiz A, Torres S, Quintana Y and López A (2015) Primer reporte de Resistencia de Cyperus odoratus L. al herbicida pirazosulfuron-etilo. Bioagro. 27: 45-50. Pataky K, Nordby N, Williams M and Riechers E (2006) Inheritance of cross-sensitivity in sweet corn to herbicides applied postemergence. J. Amer. Soc. Hort. Sci. 131: 744-751. Rucínska R, Sobkowiak R and Gwozdz E (2004) Genotoxicity of lead in lupin root cell as evaluated by the comet assay. Cell. Mol. Biol. Lett. 9: 519-528. SIAP-SAGARPA (2016) Resumen nacional por producto. (http://www.nube.siap.gob.mx/cierre_agricola/. Consultado: 23 de enero del 2018. Soltani N, Sikkema P, Zandstra J, O'Sullivan J, et al. (2007) Response of eight sweet corn (Zea mays L.) hybrids to topramezone. Hort. Sci. 42: 110–112. Valencia-Quintana R, Sánchez J, Gómez-Arroyo S, Cortes J, et al. (2013) Genotóxicidad de los plaguicidas en sistemas vegetales. Rev. Intern. Contam. Amb. 29: 133-157. Wang A, Feng X, Ye L, Wang W, et al. (2004) Studies on toxicity and mutagenicity of herbicide thifensulfuron. Chin. J. Indust. Med. 17: 13-15. Williams M, Pataky K, Nordby N, Riechers E, et al. (2005) Cross-sensitivity in sweet corn to nicosulfuron and mesotrione applied postemergence. Hort. Sci. 40: 1802-1805. Zúñiga G (2013) Sistemas de detección de daño genético. In: Genética Ambiente y salud. 3ª edn. (Alvarez MC, ed.). Universidad de Guadalajara, Guadalajara, 99-119.